Another priority of our project is and has been the construction of buildings with a very low environmental impact. For this reason we have always used natural materials. On various areas of the farm we grow bamboo, palm trees and different species of trees specifically for construction purposes. We built our first huts back in 2002 using wood from the farm especially Cedar with its rich perfume. We chose to cover the roofs of our first huts with Palm leaves which are not only water repellent but also provide welcome shade while at the same time letting the air circulate freely. In the meanwhile we started cultivating Bamboo which we now use for constructions. Bamboo is an amazing versatile material for many reasons: It grows incredibly fast (in just a few years from one plant alone it is possible to build a small house), its strength and durability, the ease with which one can work due to the light weight of it and last but not least the beauty and attractiveness of this plant. We use a material called “Cob” to plaster the walls. 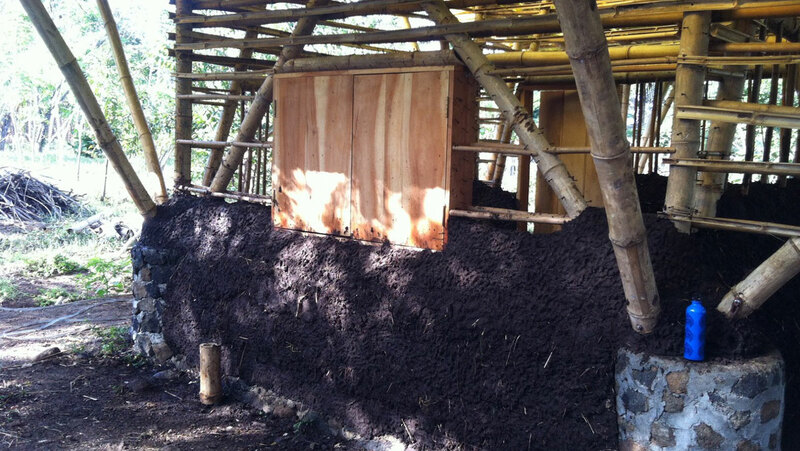 This latter is made from a mixture of earth, clay, sand, horse manure and vegetable fibres such as coconut palm fiber and hay. We enjoy using Cob for all of its positive aspects. It is a wonderful insulator, very resistant, cheap, completely organic and easy to make, use and apply. We also use a small amount of cement and rocks in the construction of the foundations. For the roofing we now use fibre glass which we then cover with organic material on which are planted plants that grow rapidly horizontally so that in time the whole roof became a living roof covered with plants which are beautiful to behold and at the same time provide shade and insulation. In this manner the inside of the house or hut remains fresh and cool.